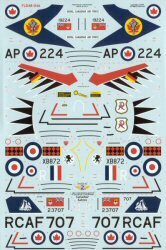 FlightDecs of Canada has released their next installment of interesting decals. In this set are five F-86 Sabres built under license by Canadair. Early marks were powered by the same J47 that powered the American F-86s, but the Mk.5 and Mk.6 Sabres had the more powerful (and reliable) Avro Orenda engine. 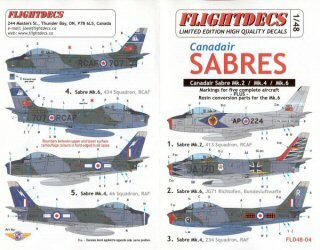 With the slatted wings added to the Mk.6, this version would be the sport model of the Sabre series. 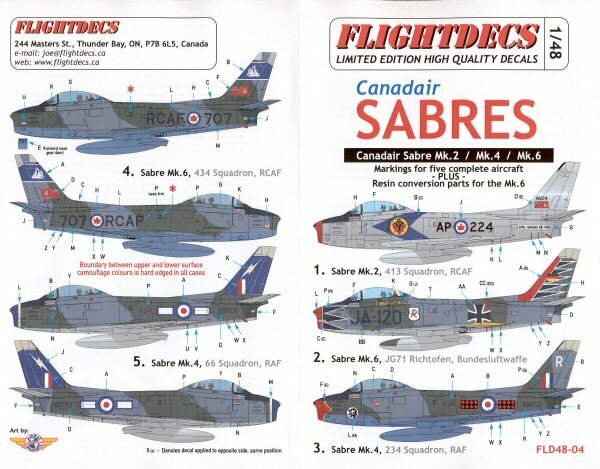 The instructions include four-views of each aircraft with nice color references and corresponding FS595 colors. 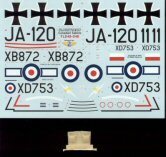 This set also includes a pair of resin air scoops that are unique to the Orenda-powered Sabres to convert your favorite 1/48 Sabre. Instructions are included for surgery and placement on your kit. My sincere thanks to FlightDecs for this review sample!